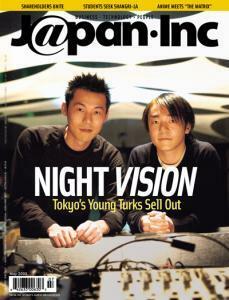 On the cover: Producers and DJs Takeo Yatabe and Sabi Takahashi of Womb and Form, Inc. prepare for another visionary night at their Tokyo club. Is the king of fast food at risk of becoming the first major deflation victim? Leo Lewis investigates. Cash-and-carry wholesalers in Tokyo treat the latest gadgets like groceries -- if the goods sit on the shelf for a day, they lower the price. Political analyst Minoru Morita talks about the widening gap between wealthy Tokyo and the rest of the country. Video giant Tsutaya and convenience store chain Lawson call out to deflation's kids. Alibaba.com CEO Jack Ma has a vision: Helping small companies buy and sell goods through his sites. It's buffalo versus beef in Japan's meat wars. Mark McCracken argues that it's easy to cut costs in Japan. Young Osamu Tezuka's wartime experiences forged the basis for Astro Boy, writes Dominic Al-Badri. A series of anime films will link "The Matrix" with its sequel. True global roaming on your cellphone. The outplacement industry rises to the challenge of restructuring. Japan's micro strengths -- whipped-up spume on a stagnant sea? Stuart Braun stays up late to find out why Tokyo's clubs pulse with recession-beating energy. Braun also talks with Sabi Takahashi and Takeo Yatabe of Womb and Form, Inc., about their success in connecting corporate marketers to the creatures of the night. Sabi Takahashi and Takeo Yatabe: Form, Inc.
"We create concepts. That's our real job, because the marketing agencies don't know what young people think or want"
Japan's historically passive shareholders are starting to speak out after years of wealth destruction and corporate scandal. Kabunushi Ombudsman, a group of activist lawyers in Osaka, is leading the charge. Stalking the Corporate Corridors' side bar. The laissez faire era of corporate governance may be drawing to a close. Jaded students who have few hopes of finding fruitful careers at home are heading overseas. But life is not easy for the expat students, even if mom and dad are often picking up the tab. Christmas wish list, singing along in Saitama and trends in pasta.